The seal and stamp policy is a top-notch one which is essentially aimed at restoring sanity to the legal profession. After engaging lawyers to prepare documents, some non-lawyers reproduce the precedents in subsequent transactions without seeking the lawyers’ approval. There are even instances where clients would connive with paralegals get precedents of legal agreements and execute same without the knowledge of the legal practitioner whose name is on the document. Also, non- lawyers around our court premises engage in preparing legal documents. This policy is a commendable one! In reaction to the seal and stamp policy, a lawyer on a social media platform asked whether membership of the NBA is compulsory. My simple response is: “there is an automatic membership of the NBA upon being called to the Bar”. As long as one has elected to join and remain within the noble profession, he is a member and must comply with the regulations set by the body. See Chinwo v Owhonda (2008). Every legal practitioner is bound by the directive of the Association. The Rules of Professional Conduct (RPC) is a subsidiary legislation made pursuant to a statutory enactment. The RPC gives the NBA powers to approve seal and stamps. There is no doubt that the policy has the force of law and is therefore, binding on all members of the Association. This analysis would consider the validity, viability, queries, prospect, constraints and other attendant issues relating to this policy. Is the NBA’s directive in compliance with the RPC? In furtherance of this rule, the official release of the NBA clearly states that from April 1, 2015, the possession of the new seal and stamp will compulsorily supersede even the payment of annual practising fee to the NBA by qualified lawyers who seek to engage in legal practise in Nigeria. From that date, every document filed by a lawyer shall be deemed to be improperly signed or filed except it is affixed with the unique stamps issued by the NBA to the lawyer. The word “lawyer” is not defined by any law in force. Black’s Law Dictionary, Sixth Edition, defines a lawyer as “any person licensed to practise law”. This is in effect, has the same meaning as a legal practitioner. See Section 24 of the Legal Practitioners Act (LPA). Can the directive be extended to lawyers in corporate employment? The NBA official release further states that documents covered are pleadings, affidavits, depositions, applications, instruments, agreements, deeds, letters, memoranda, reports, legal opinion, and to leave no one in doubtthat it intends to cover every document, it mentioned ‘any similar document.’While accredited lawyers in private practice will be given green stamps bearing their unique enrolment number, their counterparts in public or corporate employment will be assigned a red version. A careful perusal of the wordings of Rule 8(1) of the RPC suggests that any lawyer in salaried employment i.e. a lawyer in corporate employment shall not appear as an advocate, prepare or even sign any legal document for his employer. The rule is very clear and dismisses of every ambiguity. To this end, there is a conflict between the directive of the NBA and the provisions of the enabling legislation. The provision of red stamps for lawyers in corporate employment is antithetical to Rule 8 of the RPC. Rule 10 (1) of the same RPC 2007 (quoted above) which requires approved seal and stamp on all legal documents plainly applies to a “lawyer acting in his capacity as a legal practitioner”, in this case, lawyers not in salaried employment, “legal officer or adviser of any governmental department or Ministry or any corporation…” which simply means a legal officer or legal adviser of any government department or government ministry or corporation. The ordinary and grammatical interpretation of this provision excludes lawyers in corporate employment who the NBA has now mandated to apply for red seals. This is an express violation of the provisions of the legislation regulating the conduct of legal practitioners. Also, corporate governance demands that all correspondence must emanate from the office of the company secretary which invariably compliments the position of Rule 8 of the RPC.If the NBA does not extend the seal and stamps to lawyers in corporate employment, it would create more opportunities for those of us in private practice as against the current trend where in-house counsels retain personal clients and provide them with legal services which do not require appearing in court or filing processes. Should the stamp and seal be issued in the name of firms? The official release of the Association stating that the seal and stamp are for individual lawyers is apt and in compliance with Rule 10 which states: “A lawyer” and not “firm of lawyers”. I am yet to see any seal and stamps issued in the name of law firms and I doubt if the NBA would toe that line despite invitation by some for seals in the name of their firms. The hurdle which any seal and stamp issued in the name of a firm would be unable to cross is that the definition of a legal practitioner under the LPA allows for only individual lawyers whose names are on the roll to sign processes. This has been established by the apex court and followed in a plethora of authorities. The sweeping effect of the decision of the apex court in Nweke v Okafor is very fresh in our minds. The NBA is therefore, urged not to consider any application in the name of a firm. What is the penalty for non-compliance with this policy? Rule 10 is a specific sanction on the issue of a legal document which violates the seal and stamp policy while the latter is a general rule applicable to all the provisions of the rules. It is trite law that where there is a specific provision and a general provision, the specific takes precedence. 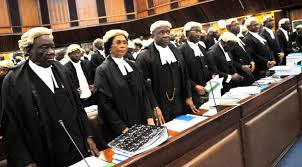 By extension, if and when a lawyer contravenes this regulation by either filing a writ without a seal or seeking to tender a document which does not bear a seal approved by the NBA, will the court apply the principle in NWEKE V OKAFOR and deems the writ as incurably bad or the documents inadmissible? These are scenarios which are yet to be tested in court. However, the principle of substantial justice may not allow the courts to adopt a similar principle as that laid down in NWEKE v OKAFOR. In any case, the provisions of section 1(2) of the Evidence Act 2011 (as amended) may persuade the court to reject any document without the approved seal since the RPC is a subsidiary legislation which has the force of law. On July 30, 2015 an application was challenged in an Ogun State election petition tribunal panel on the ground that the application did not carry the stamp and seal approved by the NBA. The applicant argued that the directive of the Chief Justice of Nigeria (CJN) provides that the courts are to set up guidelines towards the enforcement of this policy. The tribunal upheld the argument. With due respect, the reasoning of the tribunal is most untenable in the face of a subsidiary legislation (the RPC) in force. What mechanism is required to be put in place by the court or tribunal as the case may be in the enforcement of this policy? The process merely entails application to the NBA and the seal and stamp shall be issued by the Association. We can only await a decision on this issue by a superior court. Is there a conflict between the RPC 2007 and the Entitlement to practice as Barristers and Solicitors (Federal Officers) Order 1992? The provisions of Rule 8 and 10 (1) of the RPC and Rule 1 (2) of the Entitlement to practice as Barristers and Solicitors (Federal Officers) Order seem to be stating different things while they both derive their efficacy from the same principal legislation (the LPA). It is an established principle that where legislation is specific on a subject and another is general, the former shall be given priority. It is however, instructive to note that while the Entitlement to practice as Barristers and Solicitors (Federal Officers) Order is a 1992 legislation, the RPC was enacted in 2007. The RPC being a latter legislation takes precedence and accords more with reason. Support is drawn from the provisions of Section 144 of the Electoral Act 2010 (as amended) which provides that a legal officer of the Independent National Electoral Commission (INEC) can represent the Commission at the tribunal or in court. This is unarguably in consonance with Rules 8 and 10 of the RPC. At a time when the legal profession is not having it smooth, the seal and stamp policy for lawyers is a laudable one which is in the interest of lawyers as it will restore sanity and pride into the profession. It will prevent sharp practices and impersonation of lawyers by non-lawyers. However, the centralization of the scheme has made it difficult for so many lawyers to get their applications treated within the shortest possible time. The NBA should consider a decentralization of the scheme and allow branches being representatives of the national body to approve seal and stamps for their branch members. The interpretation of Rule 8 of the RPC in clear terms exempts lawyers in salaried employment i.e. lawyers in corporate employment from preparing or signing legal documents. In consonance with this provision, the NBA should limit the seal and stamp to legal practitioners in private practice and law officers in government departments. On a final note, there is the need to also consider the up-and-coming lawyers in the decisions of the NBA. If the annual practising fee varies according to the year of call, it is most appropriate that the same scale be adopted for the seal and stamp policy. This policy can be subsumed under the annual practicing fee considering its recent upward review.